Former Quinnipiac Bobcats defenseman John Furgele has signed with the Maine Mariners of the ECHL according to a press release announced by the team. The Mariners will begin play in the 2018-2019 season, were formally the Alaska Aces but were relocated to Maine for the upcoming season and will be an affiliate of the New York Rangers. Furgele, who played one season at Quinnipiac after transferring from the University of New Hampshire following two seasons there, played in 38 games for the Bobcats recording 14 points (1 goal, 13 assists) with 14 penalty minutes and was a minus five for the season. A native of Glen Mills, PA, Furgele had one year of college eligibility remaining but graduated this past May. 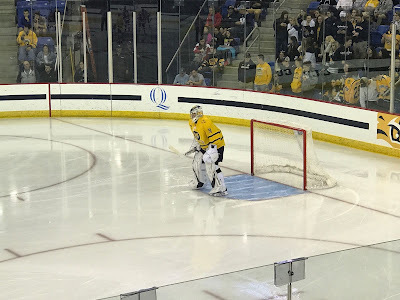 Furgele was a reliable defenseman for Quinnipiac and earned the respect of his teammates as he was an alternate captain for the team in the 2017-2018 season. In 111 NCAA games between the University of New Hampshire and Quinnipiac, Furgele recored 37 points (4 goals, 33 assists). Incoming Quinnipiac freshman defenseman Peter Diliberatore, was selected in the 6th round with the 180th pick by the defending NHL Western Conference champion, Vegas Golden Knights. 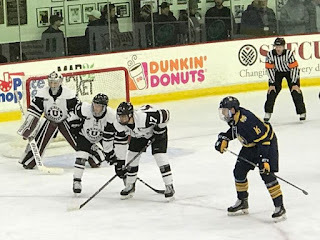 Diliberatore, a native of Bedford, Nova Scotia, Canada just completed his senior season at the Salisbury School in Connecticut. He finished the season with 17 points (4 goals, 13 assists) in 27 games played. Over his two seasons at Salisbury he finished with 35 points (10 goals, 25 assists). He was also a member of the Yale Hockey U-18 program that made it to USA Nationals this past season. The 5'11, 161 pound left shot defenseman is a mobile puck mover with good offensive skills. He was ranked 144th on the final NHL Central Scouting rankings. His draft selection marks six straight years that Quinnipiac has had a drafted player in the NHL Entry Draft following Keith Petruzzelli (2017), Chase Priskie (2016), Karlis Cukste (2015), Devon Toews (2014) along with Connor Clifton and Peter Quenneville in 2013. Former Quinnipiac Bobcats forward Landon Smith has signed a one year contract with Karlskrona HK in the second-tier Swedish league Hockeyallsvenskan per a press release from the team. The 24-year-old Smith just concluded a four year career with Quinnipiac in which he played in 143 games scoring 43 goals with 66 assists. He was limited to 21 games played in the 2017-2018 season due to an upper body injury. The Greenwood Village, Colorado native graduated from Quinnipiac this past May, helped lead the Bobcats to two NCAA tournament appearances, two ECAC regular season championships, one ECAC tournament championship and a Frozen Four appearance in 2015-2016 in which Quinnipiac finished as the National Runner-Up to North Dakota in Tampa, Florida. 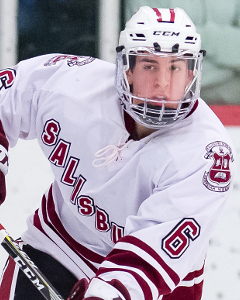 He was named to the ECAC All-Rookie team as a freshman after the 2014-2015 season. 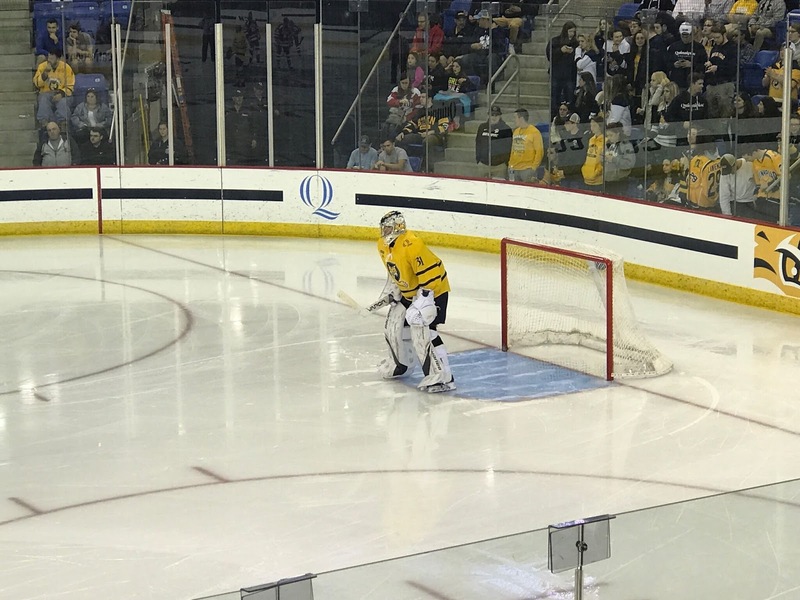 Quinnipiac Bobcats rising sophomore goaltender Keith Petruzzelli has been selected to attend the USA Hockey World Junior Summer Showcase that will be held from July 28th to Aug. 4th in Kamloops, British Columbia. The camp will give the players the chance to audition for a spot on the U.S. National Junior Team that will take part in the 2019 International Ice Hockey Federation World Junior Championships, Dec. 26, 2018, through Jan. 5, 2019, in Vancouver and Victoria, British Columbia. Petruzzelli will compete against Northeastern goaltender Cayden Primeau, Kyle Kesler of the Oshawa Generals (OHL) and 2001 born goaltender Spencer Knight of the United States National Developmental program. Petruzzelli is no stranger to international competition having represented the United States at the 2016 Hlinka Memorial tournament where the team took home the silver medal. The Wilbraham, Massachusetts native just completed his first season at Quinnipiac going 5-6-2 with a 2.88 goals against average and an .892 save percentage in 17 games played. The 2017, 3rd round pick by the Detroit Red Wings is expected to battle junior Andrew Shortridge once again for the starting goal-tending job this fall. Quinnipiac picked up its most recent commit from a player with a famous last name in the hockey world. Skyler Brind'Amour the son of current Carolina Hurricanes head coach Rod Brind'Amour who played 20 years in the NHL gave a verbal commitment to Quinnipiac for the 2019-2020 season. Coming off his first season of junior hockey with the Chilliwack Chiefs, Brind'Amour was gracious enough to give the BobcatsHockeyBlog some time for a Q&A to discuss his recruitment, his overall game and growing up in a hockey family with an NHL player for a father. Thanks again to Skyler for this interview and once again welcome to Bobcat Nation. BobcatsHockeyBlog: First off congratulations. What are you emotions like now that you have made this decision to commit to Quinnipiac? Skyler Brind'Amour: Thanks and I am just excited to be a part of Quinnipiac. It's a great school and has an awesome hockey tradition so I am just very excited. BobcatsHockeyBlog: This isn't your first time committing to a Division I program as you were previously committed to Michigan State. What went into the decision to move away from the commitment to them, especially with it being the school where your father went? Was it a mutual decision? Skyler Brind'Amour: After the season I just sat down with my family and it was in my best interest to re-open up my recruitment and decommit from Michigan State and I just felt like Quinnipiac is a better fit for me to develop as a person and player. BobcatsHockeyBlog: After you re-opened your recruitment, did other schools besides Quinnipiac reach out to you? When was the first time that Quinnipiac reached out to you? Skyler Brind'Amour: Yes, there were a couple of schools, but after a couple days I heard from Quinnipiac and it was a place I knew I wanted to be, so it worked out for the best. BobcatsHockeyBlog: Have you taken a visit yet to the Quinnpiac campus and if so what are your thoughts on it? Skyler Brind'Amour: Yes. I went a couple years ago and was very impressed with the campus and hockey facilities! BobcatsHockeyBlog: You grew up in a hockey family with your father being Flyers and Hurricanes great and current head coach of the Hurricanes in Rod Brind'Amour, but you really didn't grow up in a hockey crazed area. What is the youth hockey like in North Carolina and how did you feel it impacted your development as a player? Skyler Brind'Amour: I played all the way up in Raleigh, until my U-18 year, for the Junior Hurricanes and it was awesome. Everyone always think we didn't have a good program but we were actually one of the best teams growing up as we played all the top teams and we were right there with the best of them. I was lucky enough to have great coaches and teammates to help me out. So it was really good for my development I feel. 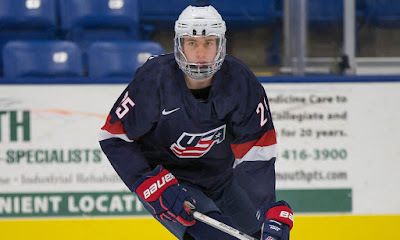 BobcatsHockeyBlog: You then moved to the South Kent School to play for the U-18 Selects program in 2016-17 and also had some time with the United States National Developmental Program. What was that experience like for your development? Skyler Brind'Amour: It was really good being able to workout and get on the ice everyday was huge at South Kent and playing for the National Developmental Program for a couple games was an honor. Just seeing the best kids at my age level and how they handle themselves, was a huge experience and something that I won't ever forget. BobcatsHockeyBlog: You spent the last year with the Chilliwack Chiefs and won the RBC cup but didn't put up huge offensive numbers as you finished the season with 24 points in 52 games. Was there an adjustment to junior hockey and how do you think you would assess your first year of junior hockey? Skyler Brind'Amour: I think anytime you transition to a new league it takes some time obviously to adjust. I would have liked to have been better offensively throughout the year but feel like at the end of the season in the RBC Cup it started to come around a little bit for me. BobcatsHockeyBlog: Tell us about your overall game as a player? What are some of your strengths? Skyler Brind'Amour: I think I'm a smart player that makes plays and plays both ends of the ice. I have the ability to win face offs and is someone who plays hard. BobcatsHockeyBlog: What areas in your game do you think you need to improve upon as a player? Skyler Brind'Amour: I feel I need to use my frame better with just using my size to hang on to pucks and the other thing is just my pace. I want to be able to sustain speed through the whole shift. BobcatsHockeyBlog: What are your plans for next year? Is another season of junior hockey going to happen for you to improve as a player? Skyler Brind'Amour: I plan on going back to Chilliwack to develop one more year before heading to Quinnipiac. BobcatsHockeyBlog: You were recently drafted by Fargo in the Phase II Draft. Are there any plans to try to make the Force out of training camp or is Chilliwack set in stone for 2018-2019? Skyler Brind'Amour: No. Chilliwack is set in stone for me for next season. BobcatsHockeyBlog: What was it like growing up with a father in Rod Brind'Amour who was one of the star players in the 1990's and early 2000's? Skyler Brind'Amour: It was pretty cool just learning from him what it takes to be a hockey player and being able to go in locker room after games and see other guys and what they do was definitely something I am very thankful for. BobcatsHockeyBlog: His physical fitness was a big thing that contributed to his 20 years in the NHL. How much has he taught you about that and is it something that you take very seriously? Skyler Brind'Amour: Yes. It's definitely something I take seriously as he just always taught me to not be out worked because that's something you can control so I've taken that to heart and he is always pushing me to be my best. BobcatsHockeyBlog: The Edmonton Oilers selected you in the 6th round of the 2017 draft. What was that experience like and are you expected to go to their development camp this year? Skyler Brind'Amour: It was a dream come true. I was very honored to be taken by such a great organization. And yes I will be attending this years developmental camp. BobcatsHockeyBlog: You have been to an Edmonton camp before last summer. What do those camps entitle and how much can you learn in such a short period of time? Skyler Brind'Amour: I learned a lot last year from the developmental camp. I think the key is just taking in all the information and the little tidbits the coaches tell you. BobcatsHockeyBlog: Is there any player that you try to model your game after? Skyler Brind'Amour: No not really one guy. I watch a lot of NHL hockey and like to pick up little things from a bunch of players and try to implement them into my game, the best I can. BobcatsHockeyBlog: To this point in your life who has been your biggest influence or role model to help you get this opportunity? Skyler Brind'Amour: I would say my dad. He's just been someone I've always looked up to as a player but more importantly as a person. And he's taught me so much, so I'm just very thankful for all he's done for me. BobcatsHockeyBlog: Tell us what type of person the Quinnipiac community will get in Sklyer Brind'Amour on and off the ice? Skyler Brind'Amour: I'm just a quiet guy that works hard and loves to compete. BobcatsHockeyBlog: Off the ice what do you enjoy doing when you are not playing hockey? Skyler Brind'Amour: I just like being outside and active playing all kinds of sports. I am a big basketball player away from hockey so love doing that. The Quinnipiac Bobcats released the 2018-2019 men's ice hockey schedule today and it features some traditional Hockey East powerhouses in single games against Boston College in Hamden and Boston University at Agganis Arena along with a two game series with two rising teams in UMass-Amherst and Maine. Also included in the non-conference slate are single Hockey East games against Connecticut and Vermont along with a pair of games against AIC and a single game against Holy Cross. The final non-conference game is a game at Nassau Coliseum against Colgate. Quinnipiac and Colgate will still meet in both Hamden and Hamilton this season but this is similar to what the teams did in the 2012-2013 season when they met in a non-conference game on Cape Cod. Here is the schedule in full below. Home games are in bold. 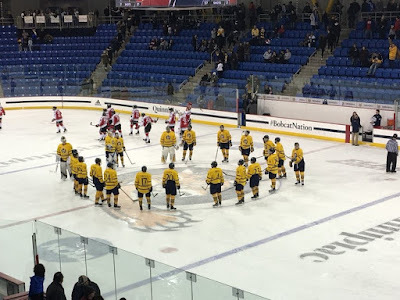 Analysis: Quinnipiac plays against some quality teams in Boston University and Boston College both that will have high end players. 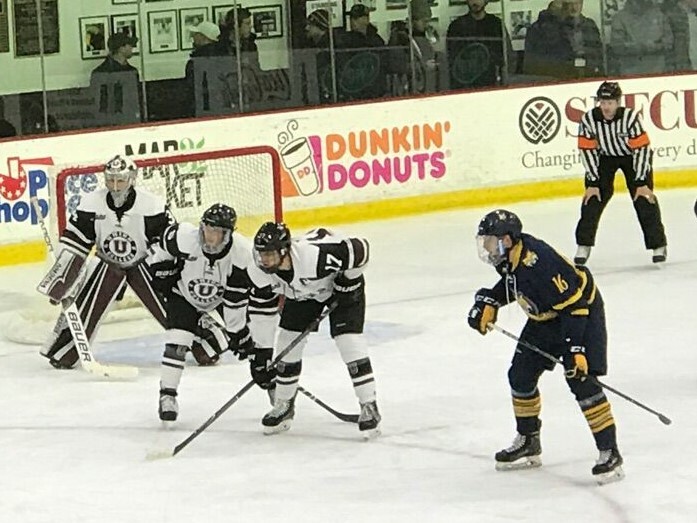 UMass Amherst also has Cale Makar returning and momentum trending upwards. Maine was solid last year but was that an aberration or are they headed upwards as well. Vermont, UConn, AIC and Holy Cross are not very good teams while playing a third game against Colgate isn't really ideal. You want to see Quinnipiac play some of the power teams from out west like the Minnesota's, North Dakota's and Denver's of the world more often. However with the amount of underclassmen this team will have on the roster and the season they are coming off of, this schedule to me bodes well where they should be able to turn things around to the type of seasons they have had in the past. Coming off a 9th place finish, expectations in the Quinnipiac locker room will be high but outside of those walls to the media and in the college hockey world in general, I would expect this team to be picked in the 4-6 range in the ECAC this season. 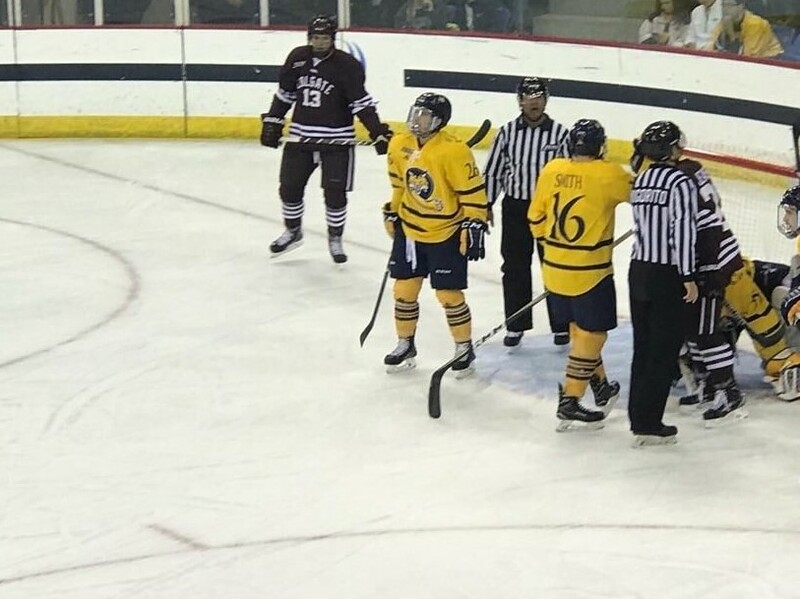 The Quinnipiac Bobcats picked up a commit with a familiar last name. A source confirms that Skyler Brind'Amour, the son of new Carolina Hurricanes head coach and former Stanley Cup winning captain of the Hurricanes Rod Brind'Amour, has verbally committed to Quinnipiac for the 2019-2020 season. Brind'Amour who played this past season for the Chilliwack Chiefs of the BCHL was previously a Michigan State commit. He was selected by the Edmonton Oilers in the 6th round, pick 177 of the 2017 NHL Draft. A native of Raleigh, North Carolina, Brind'Amour a 6'2, 175 pound center finished his rookie season with Chilliwack with 24 points (10 goals, 14 assists) in 52 games played. He added another 3 assists in seven playoff games before having a strong RBC Cup in which Chilliwack was the host team. In six games played in the tournament, Brind'Amour had 5 points (1 goal, 4 assists). He previously played with the Carolina Jr. Hurricanes U16 AAA program for the 2014-2015 and 2015-2016 seasons before heading north to Connecticut to play for the U18 Selects Hockey team at South Kent. He also has some experience with the United States National Developmental Program in the 2016-2017 season. The Fargo Force selected him in the 6th round of the 2018 Phase II Draft. Its not known if Brind'Amour will return to Chilliwack next season or look to make the Fargo Force for next season. 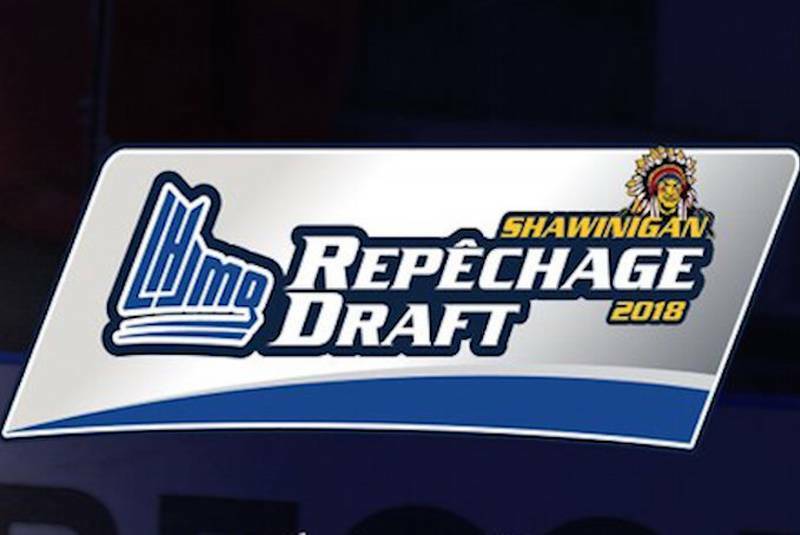 Three Quinnipiac men's ice hockey commits were selected over the weekend in the annual Quebec Major Junior Hockey League Draft. This draft features 2002 born players along with some 2001's in Eastern Canada and the New England states. In the 8th round Southington, Connecticut native Victor Czerneckianair, a 2002 born left shot forward was selected by the Halifax Mooseheads. Czerneckianair is coming off a 75 point season for the U-15 Selects Academy team at South Kent. The second Bobcat selected was Jacob Quillan in the 11th round by the Quebec Remparts. Quillan, a 2002 left shot center, is the younger brother of Colgate defenseman Nick Quillan and is coming off a 60 point season for the Steele Subaru Major Midgets team that won the NSMMHL championship. In the 13th round, Ethan Phillips, a 2001 born forward was selected by his hometown Halifax Mooseheads. He played the last two season at the Selects Academy at South Kent and will be part of the U-18 South Kent team this coming season in his draft year. His family has been a billet family for the Mooseheads for a number of years. None of the three are expected flight risks to the QMJHL at this point and the last Quinnipiac commit to head north of the border was Southbury, Connecticut native Chase Harwell who spent five mediocre years with Sherbrooke and Victoriaville before heading to Concordia University.